The Cowgirls event at Shelf Life was a whole lot of fun! Thanks to JoAnn and Shelf Life for hosting; to Betty for getting the whole thing rolling; and to Nerys Parry for the shout out at her blog. Nerys read from her book Man and Other Natural Disasters, Lee Kvern read from her latest novel, The Matter of Sylvie, Betty Jane Hegerat read from The Boy, and Barb Howard read from her brand new book Western Taxidermy, a short story collection. I read from my short story, “She Died With Her Boots On”, part of Stampede Noir, a collection of noir fiction by Calgary writers that has a connection with the Calgary Stampede. It’s currently seeking a publisher — contact me if you’re interested in more details. Next up — writing short stories, teaching, percolating a new novel idea. Waiting, as usual. Spring break for the gents, in which we will hopefully finish most of our new kitchen and have an overnighter in Banff. I am enjoying being on holiday. The launch for Barb’s new Western Taxidermy is set for April 25th at Cantos Music Foundation. More details later. Looking forward! Our fifth annual presentation of Writing in the Works was a success once again, as well as being a whole lot of fun! 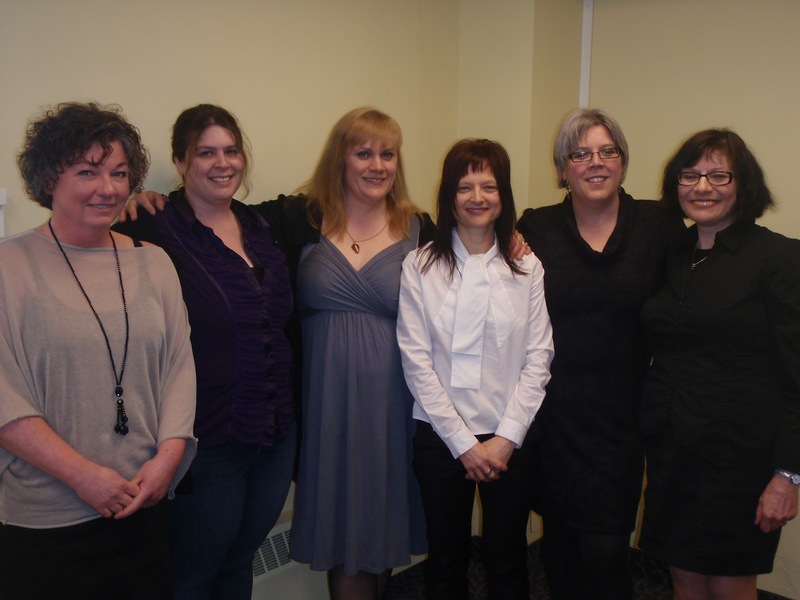 And there’s this year’s lineup of readers: L – R, Jane Cawthorne, Robin van Eck, myself, Rita Bozi, Rea Tarvydas and our emcee Rona Altrows. Thanks to Elaine, Scott, Inge, Susan, Naomi and Leslie for their hard work, to Memorial Park Library, Owl’s Nest Books, and our fantastic audience. I think a splendid time was had by all. Next up: When Cowgirls Get the Blues at Shelf Life Books, 1302 – 4 St SW, this Thursday, the Ides of March, at 7 PM. Another five reader event featuring me, Betty Jane Hegerat, Barb Howard, Lee Kvern and Nerys Parry. Thinking it’s going to be loads of fun. Hope to see you there! Many thanks to Andrea Ledding, whose review of Nothing Sacred appears on the Saskatchewan Publishers Group website. A friend of mine commented on how well written the review is, and I agree. So nice — it’s not easy to get press in these times.